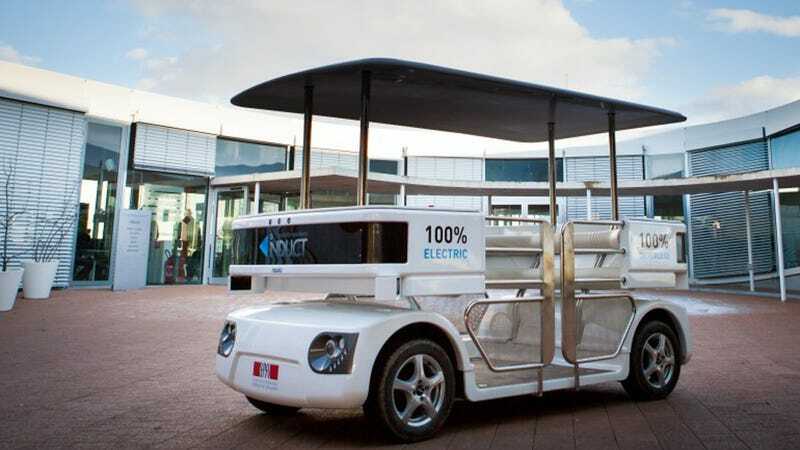 Why Walk When You Can Ride This Driverless Golf Cart? No matter how robust a city's transportation infrastructure, no matter how timely or how many buses and trains run, there's still the issue of actually getting to the bus station. And it's not like you're going to walk there like a putz. Heck no, there are driver-less trolleys for that. Take the shuttle from Singapore’s Nanyang Technological University (NTU) to JTC Corporation's CleanTech Park, for example. Sure, you could walk, bike, or skate the 1.2 miles between the campuses, or you could hop aboard an all-electric Navia. These 8-passenger open air transports are built by France’s Induct Technology. The Navia rely on LIDAR (LIght Detection And Ranging) and optical cameras to generate real-time 3D navigation maps while avoiding obstacles, pedestrians, and other vehicles. Though with a top speed of 12.5 mph (20 km/h), any accident would generally be of the fender-bender variety. And unlike a human-controlled campus shuttles, passengers can select their desired destination from a touchscreen on the Navia's dash and automatically skip upcoming stops if no one is waiting to board. Even more impressive is that the Navia system doesn't require any infrastructure upgrades along its programmed route—no overhead power lines, no tracks, no nothing. When the shuttles are low on power, they'll drive themselves back to a wireless charging station (not unlike a Roomba) to top off.